Andrew Carrière plays regularly with the Creole Belles as our very special and honored guest. Andrew's music and presence are joyous and irresistible. His vocals immediately transport you to the dancehalls of Louisiana. Born near Crowley, raised in Lawtell, LA., Andrew is the proud descendant of a long line of great Creole musicians. His father, Bebe (fiddle) and his uncle, Eraste (accordion) were in constant demand to play the local house parties and dances. His relations include Calvin, his cousin as well as Roy and Chubby Carriere. Since arriving in the Bay Area some thirty years ago, Andrew has been singing, playing triangle, rubboard and accordion in the Bay Area Cajun and Creole music community. Andrew has appeared regularly and recorded with the California Cajun Orchestra. 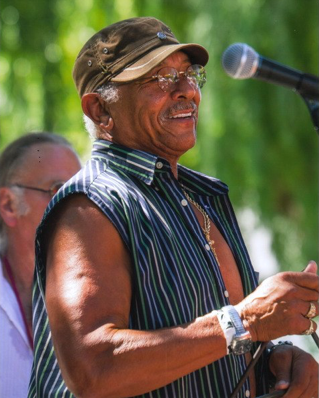 After the 2001 passing of the band's legendary bandleader Danny Poullard, Andrew has taken his place as the most sought after traditional Creole musician in Northern California. Andrew's powerful vocals and great rhythm have animated events from festivals to church dances to workshops and private parties.